Fresh water is a limited, sometimes even rare resource. Demographic growth and populations migrating towards the towns and their outlying areas create new needs as well as unintentional wastage. In many countries, especially the emerging countries, a huge amount of water is lost due to leaks in the production or harnessing facilities and above all in the often very extensive underground piping networks. The World Bank estimates water losses in the emerging countries to be over 40%. Reducing water losses can therefore play a major role in improving access to drinking water. Far better to start by looking for and eliminating leaks, which also prevents contamination, that to envisage building new, costly production plants. - The other local, regional and national players and operators. Water leaks can have significant financial and technical impacts. They can result in equipment being oversized to compensate for the losses and be capable of meeting user demand. 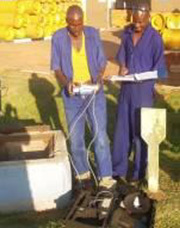 They can cause the overexploitation of natural resources and therefore cause wells and boreholes to dry up prematurely. Similarly, they can help to increase production costs (energy, treatment products, premature wear of equipment) and can cause pollution through dirty elements entering the network. Lastly, leaks can cause land subsidence, damage to building or shanty town foundations, flooding of facilities and erosion of the pipe bedding. They can also encourage corrosion of steel pipes. - The water pumping and production equipment. Leaks in equipment or engineered structures that are not buried can normally be repaired by the users or by the various workers in the water network and they are therefore easy to detect and repair fairly quickly. As a general rule, these instruments detect the vibrations or noises produced by the water that is escaping from pressurised pipes. These noises extend along the pipe over fairly long distances (depending on the type and diameter of the pipe) and in the surrounding ground. A medical-type stethoscope is used to listen to the noise captured and amplified by the resonance box. These instruments are not powered electrically nor do they have an electronic circuit. They are relatively cheap and easy to maintain. A sound probe can even be constructed fairly easily and cheaply with local materials (bamboo, wood or metal rod) with an earpiece to amplify the sounds. In an electronic amplifier, the particular hissing sound of the water leak is captured by a microphone and amplified by an electronic circuit. The most modern instruments are even fitted with signal amplifiers and interference filters to highlight the signal produced by the leak. 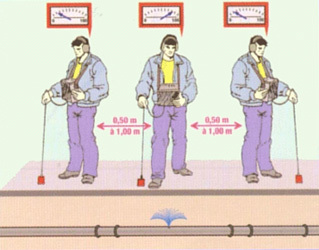 The technique involves placing the microphone on the ground at various intervals along the pipe and marking the changes in amplitude as the microphone moves nearer to the leak. 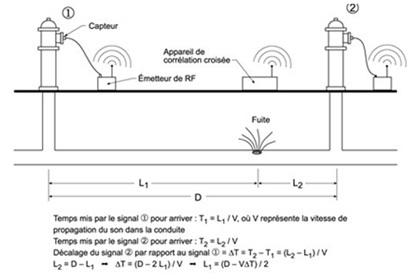 Rather than using sound levels to locate a leak, the acoustic correlator uses the speed of sounds produced by the leak when they move along the pipe towards two sensors or microphones placed in connectors either side of the leak. The operating principle is the resemblance between the two signals resulting from the noise of the leak. It determines the different in propagation times of this noise towards two sensors placed at each end of the section of pipe being checked. The effectiveness of this method depends on the scale of the sound transmitted by the leak and the sonic conductivity of the pipe. These instruments are however expensive. This involves injecting an isolated section of pipe with a non-toxic gas that is lighter than air and insoluble in water (e.g. helium). The gas escapes through the leak opening, then reaches the surface by infiltrating through the ground and the pavement. 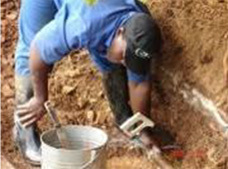 The leak is found by sweeping the surface of the ground just above the pipe with a highly-sensitive gas detector. The principle of using thermography to detect leaks is as follows : the water escaping from an underground pipe alters the thermal characteristics of the surrounding soil. The thermal anomalies produced above the pipe are detected by infrared cameras that are either portable or on board a land vehicle or aeroplane. 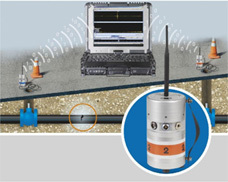 Radars are used to identify leaks in buried water pipes in two ways : they detect the voids created in the ground by the water that leaks and circulates around the pipe or the pipe segments that seem deeper than they should be due to an increase in the dielectric constant of the waterlogged soil near the leak. The length of a leak affects the volume of the water lost and repairs must therefore take place as quickly as possible after detection. It is advisable for repairs to be carried out by skilled workmen, with good quality equipment and meticulous work if such a thing exist in the region, to ensure that they are effective and long-lasting. If this is not possible, at least use the simplest procedures. Maintaining the correct pressure in the pipes, especially when there are leaks, can also prove to be a simple and effective method of limiting water losses. This mainly involves reducing pressures that are too high or not essential and limiting the major pressure differences. This reduces leaks both in the pipes and at all types of connection and at the same time acts to prevent burst pipes. Traditional detection instruments do not just detect the sounds transmitted by a leak but also all the noises in the network, such as a pump, a valve, an air valve, etc. It is therefore important to have an operator with experience in detecting leaks who will not only be able to use the equipment correctly but who will also know how to identify the leaks without making mistakes. The acoustic correlation methods are problematical in plastic pipes as the leak acoustic detection equipment has been designed mainly for metal pipes. The signals transmitted by leaks in plastic tubes have very different acoustic properties from those produced by leaks in metal pipes. The plastic tubes are more silent and transmit less noise than metal pipes. In addition, the noises are mainly formed of low frequency signals that are less easy to detect that those transmitted by leaks in metal pipes. Current improvements must therefore be applied so that leak noise correlators can identify noises produced in plastic tubes better (revision of calculation algorithms, higher-sensitivity sensor, ability to perceive low frequencies, adjustment of filters, etc.). Several technical modifications can also make the equipment more efficient : use of low frequency components of signals produced by the leaks (measuring the propagation speed of the sound in the tubes, means of verifying that leak sensors are working properly, etc.). Repair costs can vary depending on the type of leak and the equipment damaged. It is therefore difficult to give accurate estimations. To evaluate the volume of leaks, a water assessment can also be carried out at various locations in the network if there are sufficient reliable metering systems in a network or distribution sector. The water assessment is used to determine the amounts of water being lost. It can be carried out on all or part of the network. It requires detailed accounting of amounts of water entering and leaving the network (or network sector). It is normally based on meter readings and on verifying their accuracy. 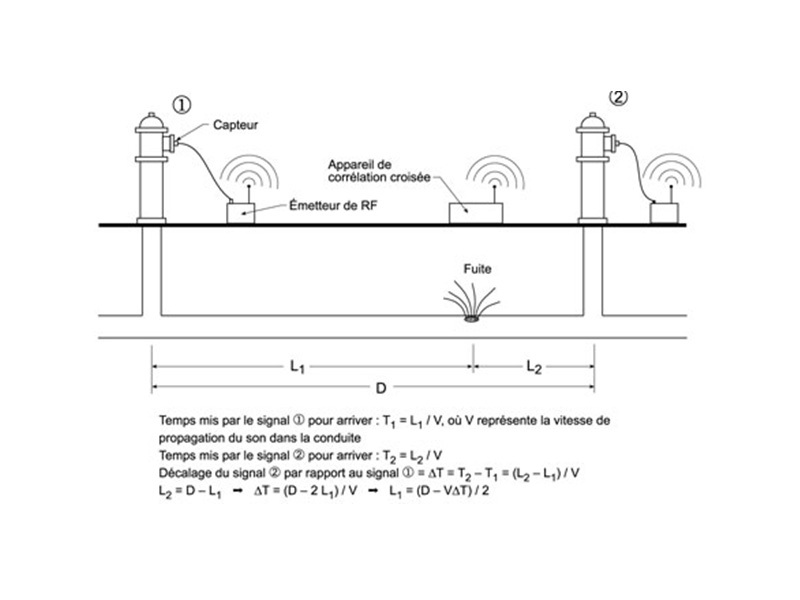 - Canada National Research Centre : "Leak detection in water distribution pipes". Interesting, four-age document indicating the main methods used. Available online at : http://www.nrc-cnrc.gc.ca/ctu-sc/fr/ctu_sc_n79. The original version of this 132-page, well-documented and highly-illustrated reference manual was published in July 2008 for the Asian water companies. It was adapted for the African water companies and gives an overview of problems of water leaks, detection instruments and methods and leak repairs, illustrating them with case studies.